Teaches specific water storage, purification and sanitation practices to follow before, during and after a major disaster to help protect you and your family from illness and disease. Best practices for long-term medication storage and documentation in a medical Grab-N-Go kit are reviewed. 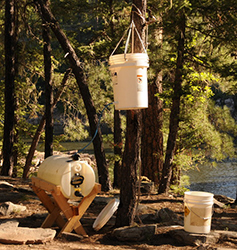 This Sawyer Water Purifier was packed in and set up at lakeside to support a Boy Scout Troop with safe drinking water. The purifier removes parasites, bacteria and viruses down to the .02 micron filter size and does not need chlorine bleach to produce safe drinking water. This system is relatively inexpensive, easily assembled and has a rated filter life of 1,000,000 liters. 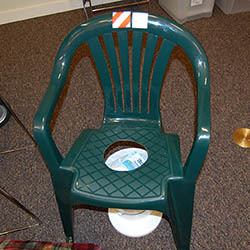 A pair of these lawn chairs, with cut out, will provide comfortable sanitary control of waste as a replacement for the restrooms in a Church or business when sewer service has been disrupted. Empty “kitty litter” buckets/lids can be accumulated and easily stored for emergency use. Several full “kitty litter” buckets will allow repeated use of the catch pail until full by layering litter on the waste after each use. Once full the lid can be installed and the bucket moved to an outside location for future pick up and disposal.